Never bother with travel insurance? Perhaps you'll be convinced of its need after reading about this tale of diners who were left floating down a river when all they wanted was a meal. A total of 83 people had to be rescued when the restaurant in which they were eating broke free of its moorings on a river in the US. They ended up about 100ft from their original spot, at the mercy of emergency services who had to use ladders and ropes to get them all back to shore. The rescue operation took several hours and while no one was injured, it could have been very different story. The restaurant only stopped drifting because a bridge got in the way, putting an end to the accidental voyage. Emergency services had to retrieve one person at a time, who would climb down a makeshift gangplank wearing the restaurant's single life jacket which was sent back up for the each person. One customer quipped: "We were joking about the river; well, the joke's on us now." The incident happened in Covington in the state of Kentucky. The unlucky punters were dining in the Waterfront restaurant when it floated away. 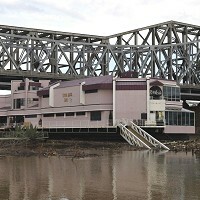 The outlet is one of several restaurants on the Covington river, and looks across the city of Cincinnati.